I like to think that I have a decent handle on new music but in this day and age with so many bands self-releasing music on the internet sometimes good bands just slip through the cracks. Chicago's Heavy Times are one of those bands that I completely missed the boat on, and shamefully so because they are right up my ally. Lo-fi garage rock with pop tendencies is as close as I can get to describing Heavy Times whose sound really doesn't fit into any one category and you can't do a band like this justice by pigeonholing them. 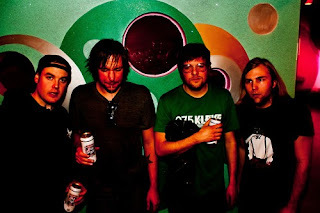 If I had to draw comparisons to other bands I would immediatly go to Guided By Voices and Husker Du who share two common traits in their songs, melodic driving guitar riffs and monster choruses that will eat you alive. Heavy Times released their debut album Dead on Rotted Tooth Recordings in 2010 and their breakout record Jacker, released on Hozac Records, the following year. 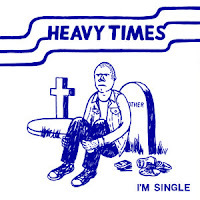 Their latest, I'm Single, a three song 7", also out on the Hozac lable, defines their sound nicely and keeps you believing that Heavy Times are destined for something bigger. The closing song "Bath Salts" just might containg the catchiest guitar hook I've heard in years. Listen to it and you'll be instantly addicted like I was.